Can I Make Aunt Jemima Pancake Mix With Milk? Aunt Jemima pancake mixes come in a variety of choices. All of these mixes can be combined with milk, and in some cases, you must use milk, or a dairy-free milk substitute. Additionally, most of the mixes require eggs or an egg substitute. Don't use water unless a mix specifically says it's okay. You not only can use milk, but in some cases you definitely should use milk, when making Aunt Jemima pancakes. Some mixes contain non-fat powdered milk, so you can technically mix them with water, although you can substitute milk for a richer flavor. Other mixes don't contain non-fat powdered milk and should always be mixed with milk. 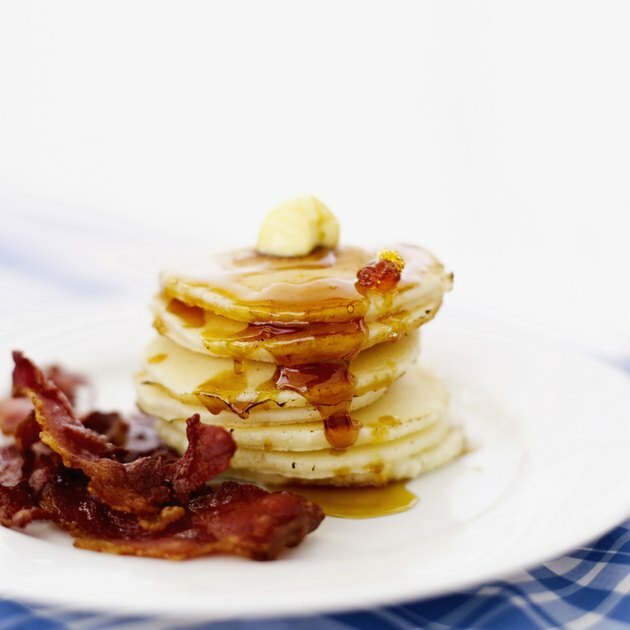 Milk not only adds flavor, but the milk fat is necessary for tender, moist pancakes. Plain water just won't give the same results. When using milk in Aunt Jemima's Pancake mixes, you have a lot of choices. Skim or 1 percent milk works well with less fat than 2 percent or whole milk. For dairy-free options, substitute soy milk, almond milk, rice milk or coconut milk. These milk substitutes may make a pancake that's slightly less tender or rich. You may also notice a slight change in flavor, especially if you use a flavored milk substitute. Coconut milk imparts a slight coconut flavor to the pancakes. Use the same quantity as you would regular milk. Although Aunt Jemima Pancake mixes are shelf-stable, once you add milk and eggs, the pancakes themselves become perishable. Pancakes are quick to make and taste best just after they're made, so make them fresh whenever possible. In a pinch, though, you can make a batch ahead for quick weekday breakfasts. Wrap any leftovers in plastic wrap or place the pancakes in a plastic bag and refrigerate them for up to three days. You can also freeze pancakes made with milk for up to two months. Heat the pancakes in the microwave or toaster and serve. Using skim milk, low-fat milk or a non-dairy milk substitute is a good start in making healthier pancakes, but don't stop there. Opt for whole wheat pancakes, rather than regular pancakes, for more fiber. Top the pancakes with fresh fruit, honey or a drizzle of real maple syrup, rather than artificial maple syrup. Read package ingredient panels as well. Aunt Jemima Pancake mixes may contain partially hydrogenated oils, corn syrup solids and preservatives. They're also usually high in sodium. How Do I Make Biscuits From Buttermilk Pancake Mix?